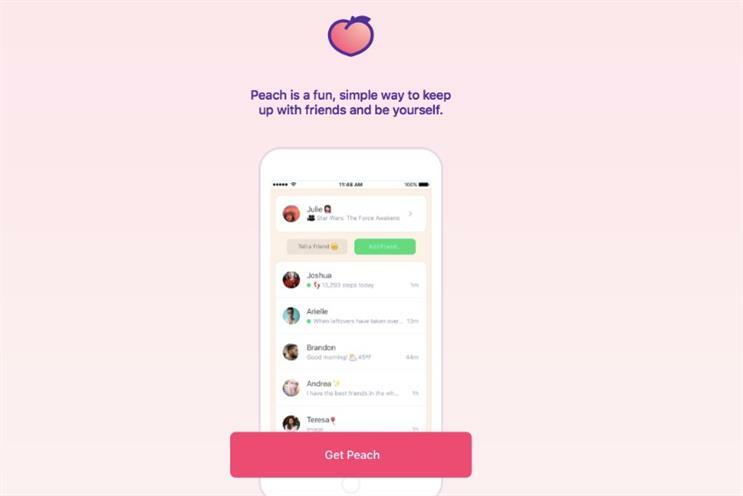 Now the dust has settled following the launch of social network Peach, Marketing takes a look at what worthwhile opportunities, if any, it offers brands. Peach launched to much fanfare last month, thanks to it being the creation of Vine founder Dom Hofmann. Since then, however, it has dropped down the App Store rankings as people were seemingly left puzzled by the niche it filled. Brands should not rule out Peach just yet, though, as it appears the January unveiling was a soft launch. In the time since then, it has been rapidly introducing new features. A drop-off in interest has been attributed by some observers to the lack of a news feed. Instead, users have to proactively click-on their friend’s profiles to see their latest activity, in a manner that has echoes of the early days of Facebook. Facebook is not the only platform Peach resembles; its functionality is a mishmash of various popular social-media sites. Alice Aldridge, lead planner at social media agency DFLondon, says: "You have the privacy of Snapchat, the friend connection that Facebook had before it became a very public media channel, the instantaneousness of Twitter and the multimedia aspect that Tumblr gives you." Its Tumblr-like nature is reflected in the ease with which GIFs, images and short clips can be posted on the site. "The functionality of GIFs in this app is much stronger than you would see on Twitter or Facebook, and it feels much more natural," says We Are Social account director John Crozier. These magic words and commands and the plethora of emojis you can use are all very targeted to the Generation Z way of using network. The instantaneous nature is most obvious in Peach’s ‘magic words’ functionality, which is perhaps the app’s defining feature. 'Magic words' allows the user to type in a specific word that acts like a hotkey; it can then post a specific piece of content. For instance, if a user types ‘here’, and then clicks on the word, it will instantly share their information. "I could see magic words being a really nice way of brands getting involved," says Crozier. "You can imagine if you were a music brand, you could own ‘listening' – it could be a post tied into the song you are listening to and you could pull that in and then maybe have a link to buy that song." Aldridge cites magic words as Peach’s differentiator, which could help it appeal to a young audience. "These magic words and commands and the plethora of emojis you can use are all very targeted to the Generation Z way of using networks," she says. Aldrige questions, though, whether Peach is actually attempting to take on the "big boy" social-media players with its amalgamation of features and new functionality, or simply waiting to be bought and folded into another app. "I can see Facebook fighting to buy the magic words functionality, because Facebook is getting ever-more complex and there are so many menus and swipe screens. So if you could simplify that, I can see it breeding new life for younger users who are not using it as heavily as older generations," adds Aldridge. Beyond future-gazing, there are opportunities for brands in the here and now. Brands would be wise to claim their brand name as a handle now, because as yet there is no verification process. MTV is probably the most active brand on the platform. Its recent activity has included a series of memes and GIFs to celebrate One Direction star Harry Styles’ birthday. "It really fits with their demographic in that it involves weird GIFs and memes around the programmes they might be pushing or the artists they are celebrating," says Crozier. However, the drawback for brands is that it is hard for consumers to find them unless they know the brand's user name, and brands are not able to pay to appear in users’ feeds as they can on Facebook or Twitter. "At the moment you can only appear in someone’s feed if they actively choose to make friends with you, so you need to work very hard at creating content in the exact sweet spot, which is, as yet, unidentified," says Aldridge. "[As it stands], the risks are very high for brands and the rewards are very low, but that is not to say that will not change very dramatically and quickly." If you are a more established legacy brand, it may not be the right place for you yet but there is definitely scope for you to test and learn. Peach certainly offers a fun alternative to social-media sites that are becoming more serious in nature, and could provide the perfect platform to reach out to a young audience. Nonetheless, brands targeting a youth audience need to take care when seeking the 'content sweet spot', as House of Fraser found out this week with an emoji-filled Twitter campaign that baffled users. "If you look at House of Fraser, there is a real risk for brands actively looking to target younger generations of cannibalising their tone of voice and looking quite ridiculous in trying to do that," says Aldridge. "There are plenty of ways to appeal to younger audiences without trying to be one of them. Brands really mess up in social media when trying to be their audience, rather than showing they understand them." Crozier believes that while the jury is still out on Peach’s future success, brands that want to be seen as trendsetters could find benefits on the platform. "If you want to be seen as cutting-edge, there is definitely an opportunity to do something interesting and cool with it," says Crozier. "If you are a more established legacy brand, it may not be the right place for you yet but there is definitely scope for you to test and learn." While Peach's attraction for brands might be limited currently, the pace at which it is releasing and improving features means it would be foolhardy to dismiss it. Founder Hofmann has already revealed a chat feature is just around the corner, which will add yet another dimension to the network. However, the key to its success will be convincing the public that it fulfils a need not currently met. "There is the old adage you can try to be everything to everyone and end up being nothing to anyone," says Aldridge. "If Peach can really champion one key feature that it can distinguish itself with, then it could have a future."